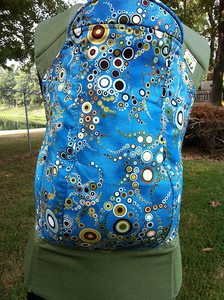 The Kinderpack is a totally different kind of soft structured carrier. It features a uniquely shaped and contoured body panel that creates a molded and rounded seat for baby’s bottom. It conforms to your child so naturally! The Kinderpack cradles their legs in upward comfort by fostering the recommended “bottom-lower-than-knees” seated position. This puts baby in a proper, ergonomic, and supportive positioning more intuitively than any other carrier. You can find the Kinderpack instructions here.